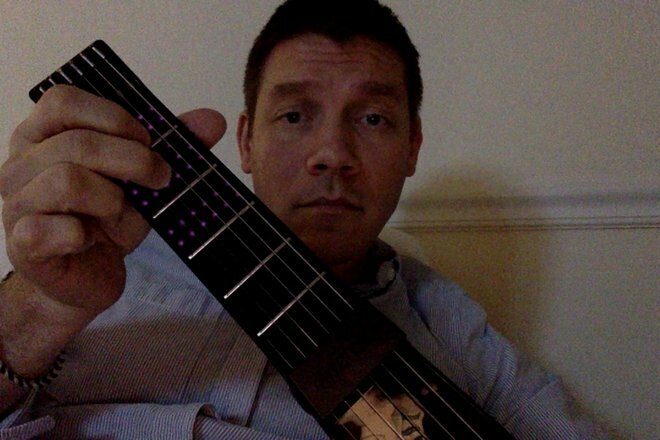 Jamstik, a 5-fret guitar-like instrument / MIDI controller. In the past, learning to play the guitar usually involved going to a music shop and learning from a professional teacher. This is still a solid means of learning, but digital music lessons have increasingly become the norm. 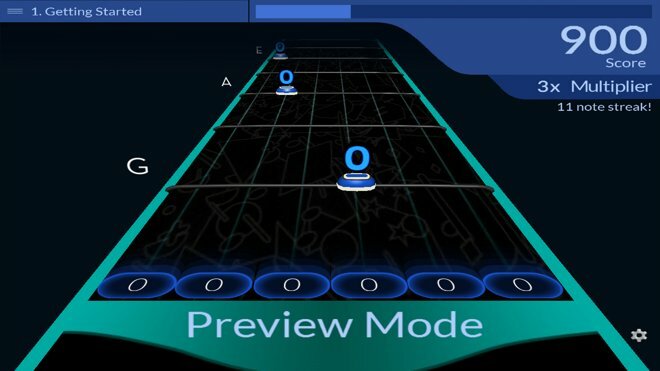 Over the years, there have been innovations like Fretlight, a system that runs fiber optic lights through the fretboard and lights up to indicate where the player is supposed to put their fingers. This is very good, and through diligent practice will help a player get better, but it lacks an interactive component. The Fretlight software doesn't know whether you've played something correctly or not, and thus can't help you correct it. Infrared LEDs barely show up in the dark. Jamstik and its accompanying lessons go further than its predecessors. 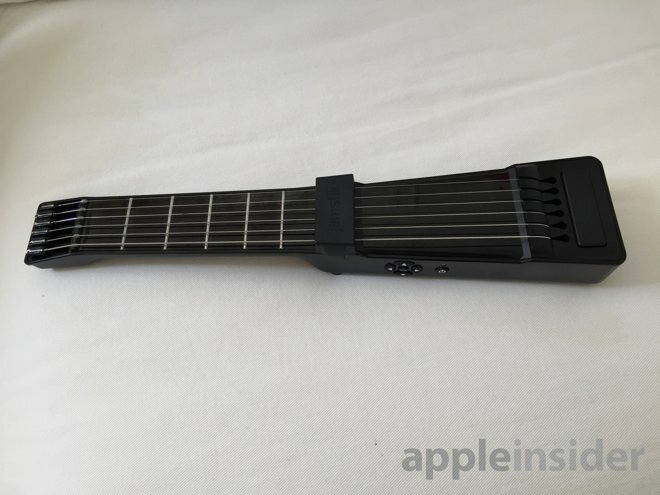 Because Jamstik is a MIDI controller, the iPad knows whether or not the note was played because it receives the pitch and attack signals from the guitar. How does it do it? The Jamstik uses infrared LEDs at each position on the fretboard and can tell when your finger blocks one of the LEDs, to determine pitch. It receives vibration of the string to determine the velocity and attack at that pitch. It is able to determine string bends as well, although this setting is off by default. Unlike Fretlight, which is a full scale guitar, Jamstik is a 5-fret instrument, which can be used as a controller for performances as much as a learning tool. It uses real guitar strings, although they're clearly shorter than those on a full length neck, and they don't require replacing or tuning. Jamstik has a D-pad, power button and power LED. Using the D-pad, we were able to shift octaves easily. An allen wrench is provided inside the battery door, under the battery, to bring the strings up to tension. The device charges using MicroUSB, and has a bi-color LED to indicate charge status, red for charging, green for charged. 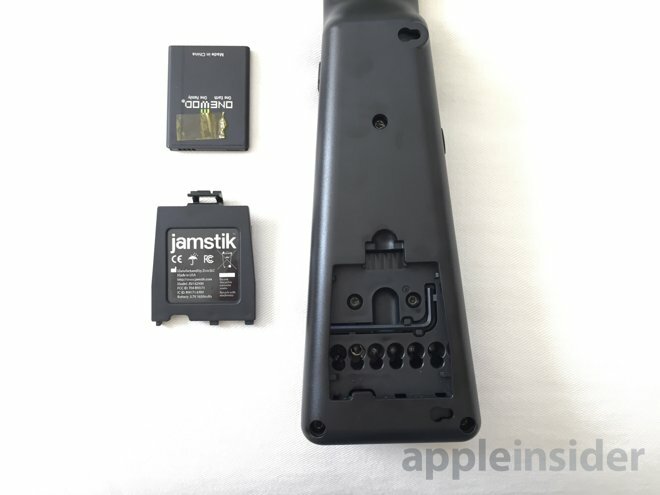 The opposite side of Jamstik has a common Micro-USB connector and LED to indicate charge status when charging. 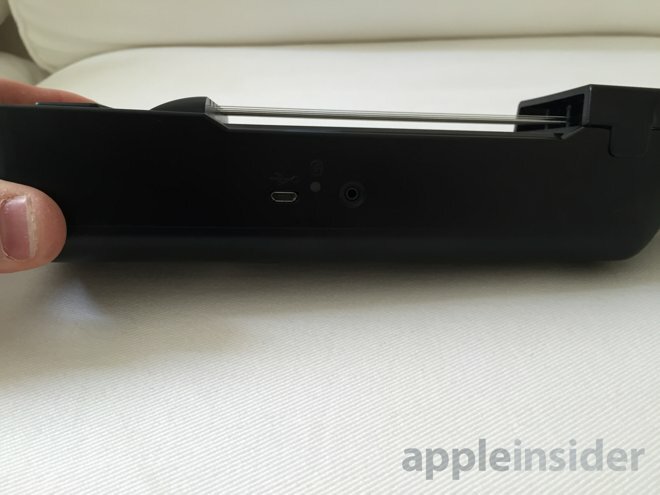 It also has a small port for MIDI out. So, we placed the Jamstik in the hands of my 9-year-old daughter, who has had a few months of guitar lessons at the local guitar shop, and asked her what she thought. It takes a bit of work to fret a string on the Jamstik, causing her to remark, "This is harder than I thought!" It works, but it's not as easy as a properly set up full-scale guitar. Underneath the battery is the allen wrench used for adjusting tension on the strings when restringing. The apps provided by Zivix are Jamstik Connect, Jamstik Tutor and JamMix. 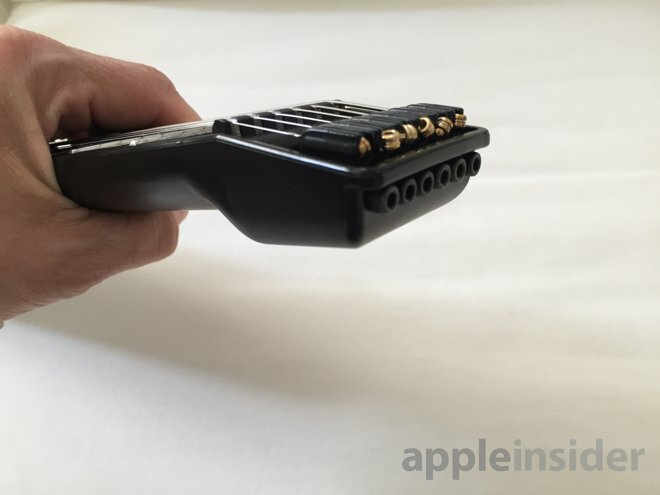 Jamstik Connect helps guide the user through initially connecting the guitar to an iPad, iPhone or Mac, and trialing sounds. Lest you think 5 frets is too limiting, it's possible to use the UP and DOWN arrows of the D pad on the Jamstik to change octaves. These allen screws adjust the tension on the strings. There's no tuning, per se. Jamstik Tutor provides lessons, and does it in a few different ways. 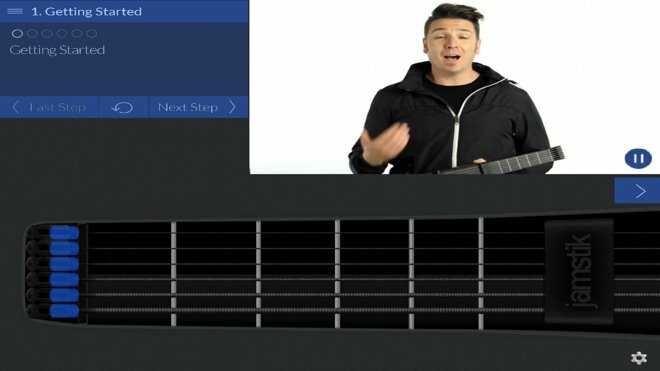 One interface sets the goal and marks progress in the upper left quadrant of the screen, has a video of Chris Heile, Jamstik's musical ambassador, in the upper right demonstrating the skill, and then shows a 2D drawing of the fretboard, both showing the desired note (like Fretlight) and where your fingers are actually positioned on the fretboard. This way, you can move your fingers to match the goal. But it also has an "arcade interface" that is reminiscent of several "hero" or "band" video games from a few years ago. Having never played those games, the 9 year old said, "This is hard!" Back in the three-pane view of JamTutor, she responded much more positively to the lesson on fretting the strings: B string. "This is nice! I'm repeating it!" And this is really a good indicator of the experience. If you can stick with it for more than 5 minutes, it grows on you. We humbly suggest if you have an interest in learning an instrument and are willing to spend the money to buy a Jamstik, that you probably are willing to stick it out. But it does a little more. 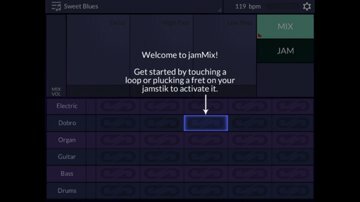 JamMix is an application that allows you to trigger loops with the frets and strings. It also works with inter-app audio and AudioBus, so it's possible to pipe audio through AniMoog to Garageband. We also like using it with Loopy/LoopyHD. 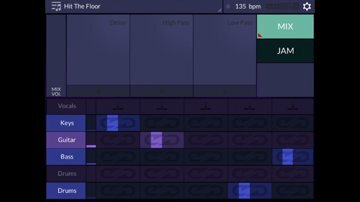 The JamMix app allows you to play loops included with the app, and then jam over the top of those loops. 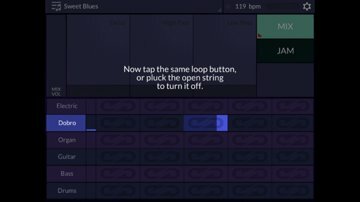 You play a string at a fret once to start the loop in jamMix, and play the string open to stop the loop. 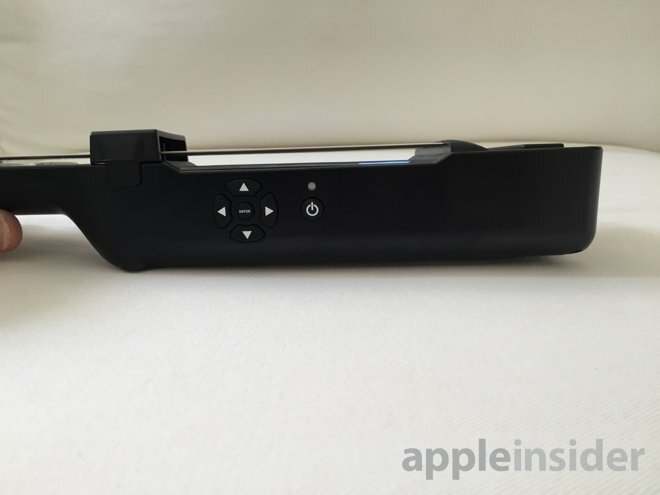 What are the downsides to the original Jamstik? It's very intentional. You have to work very hard for arpeggios to not register the wrong notes. If you're a guitar player then it can help you play the guitar better. The Jamstik doesn't do hammer-ons or pull-off notes, either. If you're used to doing that on a traditional guitar, you'll find those notes don't register here. Slides from one fret to the next also aren't allowed, because each pitch requires picking the string to generate a new note MIDI signal. When connected to the Mac using Z-fi midi and GarageBand, the controller would occasionally have lag, and it would take a while for notes to catch up, as if they were queuing. The included strap buttons aren't permanent. In our tests, we found they kept falling out. It's easy to have the strap come off while in use. Recording the Jamstik is interesting —we found that when we recorded the input in GarageBand on Mac, our mic was picking up the plinking of the strings in addition to our voices. If you listen to the video we made (included below), you can hear occasional wrong notes. We assure you, we played them correctly. It didn't always understand notes perfectly, especially low F on the 1st fret of the first string, when played as a barre chord. It wanted to play it as an F-sharp. The same was true of high F on the 6th string 1st fret. Despite these shortcomings, Jamstik is a very good learning tool, and if you understand its limitations, can be a really interesting performance tool. The Zivix Jamstik is available now for $299.99 from Amazon.com. Alternatively, Jamstik is on sale for $199.99 at StackSocial for the next few days. A new Jamstik+ Kickstarter project is currently underway and seems to come with a few improvements. Just based on the videos showing a person playing on stage on it, we suspect the action and recognition of notes to be a huge leap forward from the original. The original version uses Wi-Fi only, while the new one uses Bluetooth as well. The new Jamstik+ also adds a hexaphonic magnetic pickup, for a more traditional guitar sound. The original version was sold in Apple Retail stores across North America, and the Jamstik+ Kickstarter has already been funded. We have no doubts about Zivix or their ability to deliver, and we can't wait to get our hands on Jamstik+.